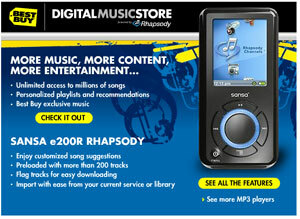 Best Buy has joined forces with Rhapsody and SanDisk, unveiling the Best Buy Digital Music Storec. The new service is powered by the RealNetwork‚Äôs Rhapsody 4.0 music service, and features both a permanent download store and a subscription download service. As part of this launch, Best Buy also will carry and promote the SanDisk Sansa e200R Rhapsody MP3 players, which have been optimized to work seamlessly with the Best Buy Digital Music Store. The Best Buy Digital Music Store and the Sansa e200R Rhapsody players will both be available at participating Best Buy stores as of Sunday, October 15th. The Best Buy Digital Music Store will launch with an exclusive track from Diddy, coinciding with his new CD, Press Play, which goes on sale October 17. By aligning with RealNetworks and SanDisk, Best Buy leverages its position as an entertainment leader, its understanding of consumers, and the strengths of RealNetworks and SanDisk to bring an end-to-end music solution to its customers. Best Buy is the #1 retailer of MP3 players in the U.S. SanDisk is the #2 manufacturer of MP3 players in the United States, and has been growing market share rapidly over the past year. RealNetworks is the #1 digital music subscription services provider, with more than 1.6 million subscribers.